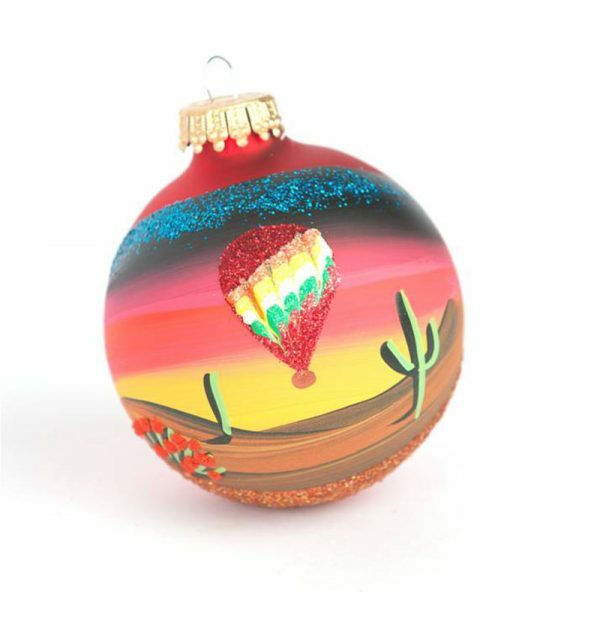 These beautiful, hand painted glass ornaments are all crafted by Arizona native Brenda Schodt right here in Arizona. Each ornament features intricate stroke work as well as sand, cacti and balloon detailing using small rock, glitter and other materials to bring your ornament to life. Choose from a white glass ornament with morning scenery, a red glass ornament with a sunset landscape, or our new golden glass ornament with a daytime look. Available in Red (sunset landscape), White (daytime landscape), and Gold (sunrise landscape).